Vintage - Royal Grafton China Tea Set, "Malvern Pattern #6527N, (32) Pieces, Circa 1935. 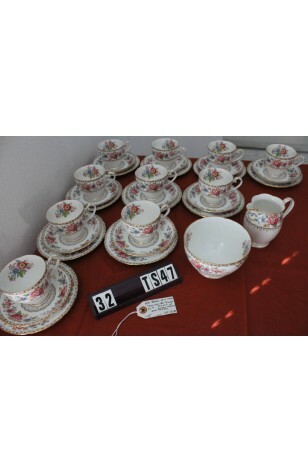 This is a gorgeous Royal Grafton China Tea Set (Service for ten) in the wonderful "Malvern" Pattern #6527N. These are Highly Decorated (10) Tea Trios, along with the Sugar Bowl and Creamer. White Background, Scalloped Verges in Blue/Yellow, as well as Rim. Floral Band on the Lip. Bouquets also inside Cups & Sugar Bowl, and All Trimmed in 22kt Gold. Florals are multicolored in Red/Blue/Yellow/Green and Lavender. Plates are slightly Scalloped. 10 - Saucers - 5 1/2"